Pier Pavilion and soon falls in love with Christian Searle, one of the stagehands at the theatre. Laura aspires to a life of riches but this annoys and frightens the proud and insecure Christian, causing rows between them. When she is offered the chance to perform at the theatre, her love for Christian is put to the ultimate test. Charles Willard, a wealthy and arrogant aristocrat becomes fascinated by her and pursues her relentlessly, causing Christian to become enraged. Will Laura’s desire for wealth throw her in the arms of Charles or will her feelings for Christian prevail? After reading the enchanting fantasy tale of The Necklace of Goddess Athena, I marked this author as one whose books I won’t miss. 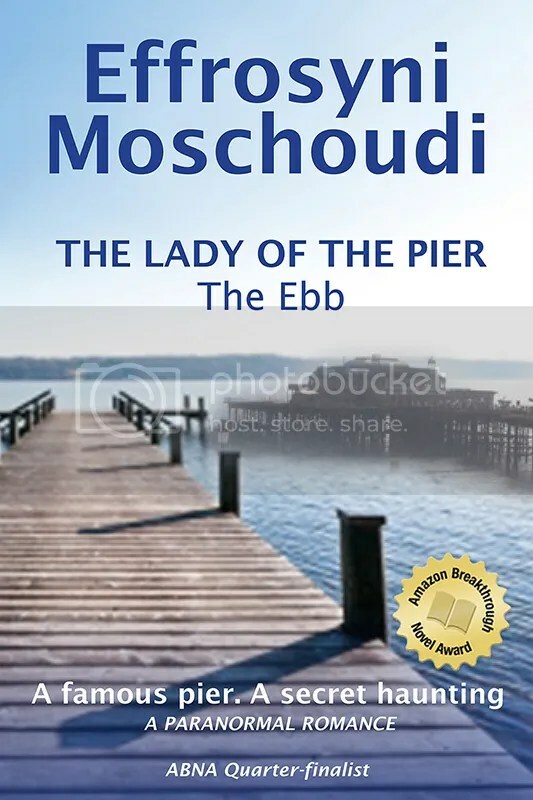 The fact that this second attempt of Effrosyni Moschoudi cleared the second round of the Amazon Breakthrough Novel Award contest is a further testament to the writer’s talent. Emancipated Laura finds love and her star shines brightly in Brighton in the ‘30s. Insecure Sophia finds love and a modicum of independence from her overbearing parents in Corfu in the ‘80s. Different places, different eras. But what binds the two girls in a common fate? And who is the lady of the pier? As with Effrosyni’s previous book, I found myself immersed and mesmerized. The writer has an undisputed talent for creating vivid imagery through her amazing descriptive skills that managed to stay with me long after I’d put the book down. No, this was not one of the books that I speedread, needing to devour the story. Here, I needed to savor. I found myself rereading parts just to refuel a scene’s energy to keep it running in my mind longer, and I got withdrawal symptoms when I finally ended it. It’s not just the two enticing stories, the breathtaking beauty of the landscape, the authenticity of the characters or the heart-warming dialogue; it’s what reigns over these. An inner glow, an inherent purity that emanates from the pages to create a sense of completeness, like a dream you don’t want to wake up from. I’m so glad I’ll get to live the dream again in the book’s sequel, The Lady of the Pier—The Flow! For an exciting excerpt of The Lady of the Pier, head over to my complementary excerpts’ blog by clicking here. A lovely review Maria – Frostie it’s on my to read pile! Thanks for the positive vote, Ekaterina!